On one of my walking routes I pass by an older home set back from the street. Each year, in spring, I anticipate the burst of colour on the lawn. 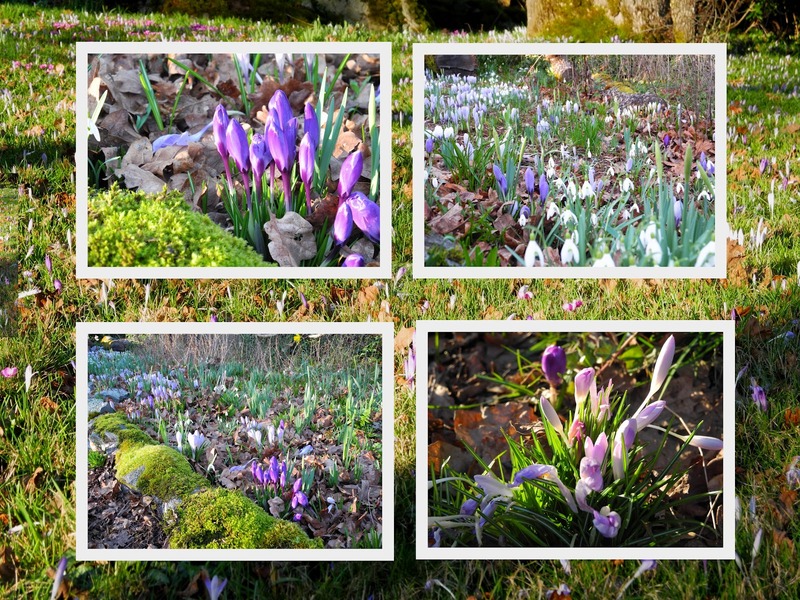 Naturalized crocuses have spread there over the years, and the result is a green lawn speckled with various shades of purple. Mossy rocks line the driveway and the bed alongside is now full of crocuses and the last of the nodding snowdrops. I saw one sunshine yellow daffodil blooming and there will be more to follow. Today on southern Vancouver Island the sun shines brightly but there's a strong, cold wind tempering the warmth. Still, I think we'll put on our hats and gloves, bundle into our heavy coats and brave a walk on the beach. How are you spending this sunny Sunday afternoon? What's bringing colour into your world? Linking to Mosaic Monday and Sunlit Sunday. Those crocuses with the sun shine to add light are just beautiful and so welcome on your walk, I'm sure! We have been adding a rail to our back deck - in ancicipation of granddaughter Wiley visiting this summer! Too cold still for flowers in Colorado. What a beautiful sight those crocuses must be! The day up here started out bright and sunny, and then we had rain and then sleet and then....SNOW! Now the sun is shining again, as though nothing untoward had fallen from the sky! Such lovely colours. I have been in the garden all day as we have had a very warm day for this time of year here. Oh how I love the lilac and green colors together. It is about 60 here and the entire week is to be warm. I so enjoy the sun shine. Will soon have tulips. Precious little color here...dirty snow and mud. My forsythia are still brown and so I am waiting for them to begin blooming sometime...I forget how long it takes once they've been forced. Lovely spots of color showing up there. You'll have lots and lots more before we see any. And purples is such a lovely color to usher is spring. My purple hyacinths are blooming and they make me smile! Your crocuses are so pretty and I think ours are going to be early this year with the unusually warm weather we're having. The crocus really do give a lovely purple color. my crocuses are in bloom,too.the sun was shining yesterday but today is it gray. Beautiful snowdrops and crocus, even prettier because they have naturalized in that garden. Yesterday for our Sunday walk we followed the river for a little while and saw a pair of nesting herons. The nest was high up in an old tree and huge,I could have kicked myself for not having my camera with me. Oooh, look at you and your fancy collage! I love it!! Seeing the first crocusses each year ALWAYS puts a big smile on my face. Thanks for showing us signs of spring. I was just thinking back to a trip I made to Victoria 3 years ago after looking through some of my photos and thinking of making a collage of the wonderful colours of early spring there. Only the blue skies provide brilliant colour here - otherwise the colours that surround me are white, greys and browns. Very nice collage, we also have a lot of crocusses in The Netherlands. I like this little ones! The crocuses would be a beautiful sight in the lawn. It's too early here, but I noticed this year that my patch of snowdrops has expanded. Thank you for linking your "colour" to Sunlit Sunday. So pretty! What a great site to see on a walk. A bit chilly here to still. Some days are brilliant and others bring a reminder of late winter. But there's colour in the garden, small patches of it, granted, but glorious, all the same. Nearly all regions of Germany have their own version of Low German. Or Plattdeutsch. They are not just dialects or inflections, they are actually different ways of spelling, speaking, and incorporate many words which are unrelated to High German. Love the colour of crocus. It's nice to meet another Canadian blogger, and one from my favourite part of the country. We have family that live in Sooke and we just love to visit there.